The National Day of Kazakhstan was celebrated at EXPO-2016, a gardening fair held in the Turkish city of Antalya. "The main aim of the National Day was for visitors of the event and people in Turkey to learn more about the Republic of Kazakhstan, its unique culture and, of course, its biodiversity," said Gulnara Sitpayeva, Commissioner for Kazakhstan's Pavilion, before the start of the event. An international scientific conference was organized to mark the occasion. It was attended by Kazakhstani and international experts. 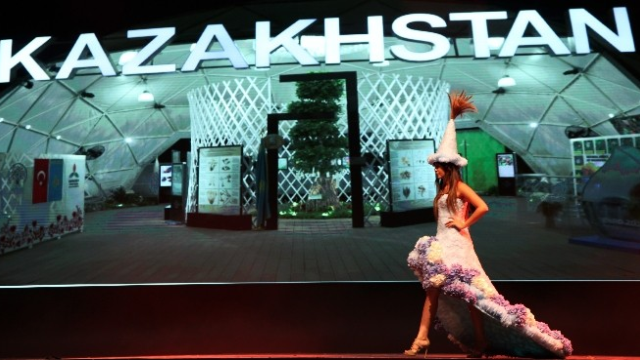 The guests of Kazakhstan's Pavilion were greeted by girls in dresses adorned with fresh flowers, while a chamber orchestra performed both traditional Kazakh music and well-known world hits on national instruments. Besides enabling visitors to explore rare plants included in the IUCN Red List of Threatened Species, Kazakhstan's National Pavilion gives them an opportunity to discover the culture and history of the Republic and offers an interactive tour of EXPO-2017, which is scheduled to take place in Astana next year. "Next year's International Specialized Exhibition EXPO-2017 takes place in Astana, the capital of Kazakhstan. We hope that the Turkish delegation will be actively involved in the upcoming event. As we see it, it will be cooperation in social policy that will promote relations between the two states," said Yerlan Sagadiyev, the Minister of Education and Science of the Republic of Kazakhstan. According to the organizers of the event, EXPO-2016 in Antalya has so far been visited by over 2.5 million people.